It's my second card in a row using the marker to image technique for stamping, but I cannot resist doing it for the pretty floral images I have. 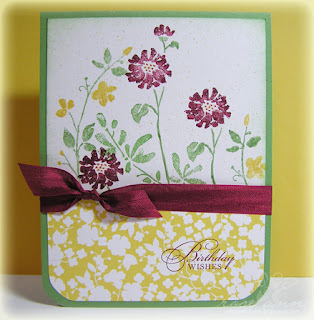 This card is made using the Watercolor Trio stamp set from SU. I made this for the Perfect Squares Review at Splitcoaststampers. I've used my Perfect Squares to measure and score the fold, and also to help round the bottom corners of my card. This is so gorgeous. I am very happy that you are sharing your beautiful creations again. Missed you! Beautiful, Rose Ann! The SU! images are perfect for that technique!!! absolutely gorgeous, love that technique, must try it again soon! Just lovely! I love that stamp set! Great colors and the spritzing really adds to it. Great look with the rounded corners! That's another gorgeous creation, Rose Ann! Love the wildflower florals. Beautiful card, Rose Ann.